The rules are (quietly) changing once again. Only a handful of lawn and landscape contractors are profiting from this new strategy as I write this article. I hope you will have the courage to read, listen, watch and learn. This could be HUGE for you…if you have an interest in selling really BIG or really PROFITABLE lawn service contracts. Here’s the (short version) of the story. New technology is all around. There’s no place better than the lawn maintenance industry to find new technology. In case you missed the news…lithium battery powered lawn maintenance tools are finding their way onto lawn trucks and into landscapes everywhere. First, a little history. Lithium powered lawn tools were made popular on late night TV when the Worx GT String Trimmer was introduced to the USA in 2007. Using direct response marketing, 313,000 of these small, lightweight battery powered tools were sold within 12 months of initial offer. These little string trimmers were mostly purchased by homeowners…and many of these purchases were made by WOMEN seeking equipment that was lightweight and super-easy to use. The (seemingly) instant success of this product really opened the doors for the Worx brand. By 2009 the Worx GT was being sold in Lowes, Home Depot, Costco, Walmart and more. 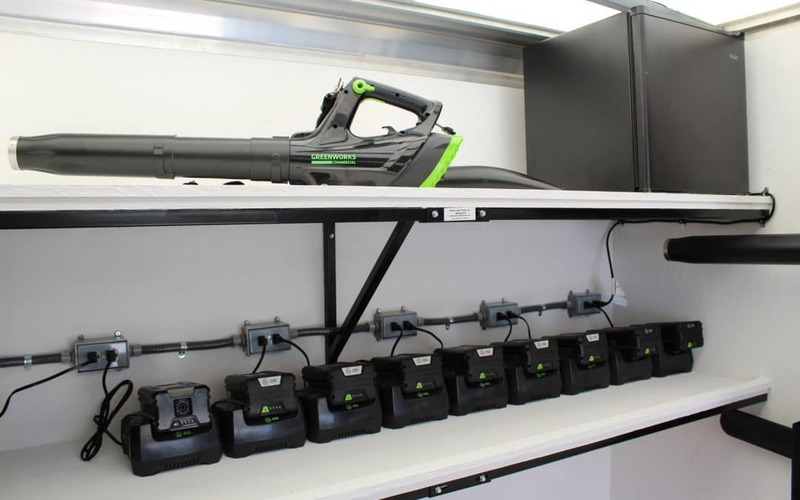 Ten years after the Worx GT bursts on the scene, there’s over two dozen brands of lithium battery powered lawn and garden tools. This “next generation” of battery powered hand tools are extremely powerful. In fact, in my test, some of these tools have comparable power to gas powered hand tools. Why? Battery technology has improved some 50% to 80% in 10 years. You’ve heard of Tesla right? The manufacturer of the super-fast electric powered car… Well, Elon Musk and the original founders have been working on the lithium battery “challenge” spending millions of dollars on R & D since 2003 – that’s 15 years now. Cars with zero emissions are now a reality. Tesla has forced the automotive industry to invest billions on their own zero emissions cars. The new movement to battery powered cars is so popular, ten countries have announced they will outlaw gas and diesel powered cars over the next 20-30 years. And very quietly…some of the R&D in automotive battery technology has made its way to weedeaters, lawn mowers, chain saws and blowers. Just visit the big box stores – Lowes & Home Depot – sometime over the next few days. Take a look at the aisle-long displays of battery powered lawn maintenance tools. The gas-powered tools, just like the gas-powered cars, now have serious competition. I’ve been in the lawn industry since 1987 – 31 years now. My clients (owners of lawn & landscape companies) are scattered all over the USA and Canada. Most of the folks I work with are either: a) really successful or b) want to be successful in the near future. Since my reach goes into companies in 45 states and across Canada… I have an “inside track” on what’s REALLY working in the lawn and landscape industry. Which brings me to the meat of this message. Two clients of mine have been awarded 7-figure lawn maintenance contracts BECAUSE they are offering a QUIET lawn service. There’s big money being committed to the idea of QUIETER services. These cases are NOT some small residential account that houses a tree-hugging, government employed liberal paying $30 to get their lawn mowed. In a second case, my client was able to boast a 19% premium over the second bidder by promising all of their hand-held equipment to service the assisted living facilities, including blowers, weed whackers and push mowers would be “electric powered”. Again…a 7-figure contract WITHOUT being the low-bidder. Very smart! Is Battery Powered Equipment Tough Enough? Powerful Enough? Dependable Enough? Ask a Tesla owner if their car works as good as or BETTER than their gas car. And…if you really want to know about battery powered equipment BUY IT & TRY IT. But please…don’t waste your time on the Worx GT weed eater. That’s a fine tool for a home owner who cares for a 5000 to 10,000 sq ft lawn. But it’s not what a pro needs. Go get yourself a 82 Volt Greenworks Commercial trimmer, chain saw, pole pruner, stick edger, hedge trimmer, 21″ push mower, back pack blower, hand blower or (if you have the guts) 60″ ZTR. You’ll never have to work on a carburetor again, mix smelly gas/oil or kill someone’s turf when filling the tank. No more pull cords, spark plugs or air filters. This is going to be a game changer! One last thing. The devil is in the details when you’re considering battery powered tools! Do YOUR research! All battery powered tools are NOT created equal. Here’s a resource for you. Let me know if you take this idea and turn it into a 7-figure contract in your town. It’s certainly being done in our industry today. And you could do it too! Tony Bass is the founder of Super Lawn Technologies. He is the co-author of The E-Myth Landscape Contractor: Why Most Landscape Companies Don’t Work and What To Do About It. You can contact Tony at Tony@tonybassconsulting.com or 478-822-9706.